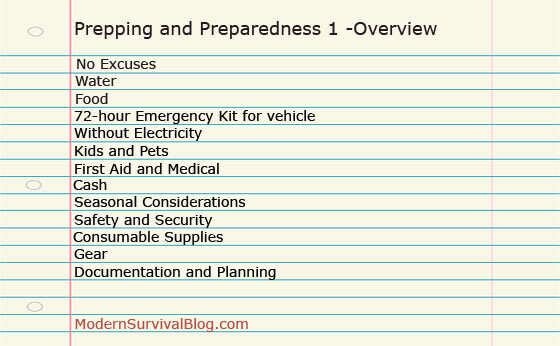 “Prepping and Preparedness 1” is being prepared for about 1 week of disruption. It’s really pretty easy to be prepared to this extent. That said, and perhaps surprisingly, most people are only prepared for up to 3 days of disruption before they would need to resupply. If you want to get started prepping and you’re not quite sure how to go about it, I can almost guarantee that once you begin taking action you will become motivated and easily make it to level 2. If all you do is complete level 1 and 2, you will be set up for most all ‘typical’ disruptions that are most likely to come your way. What is Level 1 Preparedness? First, it is NOT preparing for Armageddon, SHTF collapse, or “doom and gloom”. Instead it is simply preparing for the most common disruptions likely to affect you. It’s about being just a little bit more self-reliant and self-sufficient. Like most working people, your day is likely very busy and filled with the stresses of life. This may be especially true if you have kids at home! You may feel like you have little or no extra time to do anything else. Maybe your budget is strained (whose isn’t right?). HOWEVER, there are very real risks in this modern world and there is a high probability that “something” is going to affect you sooner or later, and you best be prepared. Preparedness is pretty much like any other insurance. You will exchange some of your money for insurance against a time of disruption – wherein you will be paid back for your troubles. Except in this case you’re actually stocking up with some tangible assets that will be available to you at any time. No excuses. Get started. This will not cost much of your time or money. Did you know that without any source of water (this includes the moisture content in your foods) that you will most likely die within 1-week without it? Look it up. It’s true. The good thing is that preparing at level-1 is easy enough in this regard and there are several options available to you that I will be discussing. The majority of events that may lead to several days or more of disruption have to do with severe weather. This typically affects and relates to a lack of electrical power when your part of the grid goes down from some sort of damage. There are several things to consider in this category so as to minimize your disruption and inconvenience. They include cooking, lights, cell phone, and others. I’ll get you up to speed with solutions. Injuries happen often when you least expect it. Being ready and equipped with at least a minimal First Aid Kit is part of level-1 preparedness (at home and in your vehicle). For those with unique medical concerns, this must also be addressed for preparedness sake. When the power is out in your area, that means no ATM’s, credit and debit transactions will not function, and many stores will simply close. However cash will often get you out of a jam. So keeping an amount of cash at home is highly recommended. A disruption during the cold depths of winter or the hot humid days of summer? Depending on where you live and your own climate, there are ways to mitigate these problems to an extent. Do you have a fire extinguisher (or more than one??) at home? Do you know what to do if you inadvertently start a grease fire on your stove-top? Do you know the best way to interrupt a burglar in the middle of the night? I will discuss some common-sense tips on safety as part of level-1 preparedness. There are a number of consumable (throw away) supplies that you should have at home that will help get you through a week without all of the modern conveniences that we’re used to. I will list the basics. Basic gear such as flashlights, battery pack for charging cell phones and smart devices, special tools to shut off utilities, battery powered radios, and others will be discussed in this category. Having a minimal set of specific hard documentation and having a plan will make things easier when your disruption occurs. I will explain this in more detail. I like what you put at the top of the list Ken, “No Excuses”. That is so true. I know people will complain they don’t have the money to spend on extra’s, but hey you don’t need money to turn on your tap and fill several containers with water to store. We all have containers of one sort or another. Are they being used right now? If not, fill some to set aside. If you find you need the container for something else, you can always dump the water or better yet, water some plants. Then you can use the container as you would for whatever. I completely agree with the no excuses. Buy a bag of rice to start or a bag of beans you can get a 1 lb bag for 1.50. I guarantee everyone has that much to spare. Now you have 1-2 days of food depending on how many people you are trying to feed. Start looking at wants verses needs to see where you can get more money to spend. Heck, the Ramen Noodle packages are PENNIES. I know, I know…they’re not that good, they’re heavy in sodium…I know. But unless you have a serious medical condition, a pack of Ramen Noodles and a few cups of hot water will fill your belly for a meal. A 12-oz can of pork & beans is less than $1. I have seen people actually throw change away on the parking lot because its not worth their time to bother putting the change away. That thrown-out change could be THE change used to buy a can of pork & beans. If you’re hungry, you’ll pop that top and stick a fork in it. It will fill your belly. Regarding the food component for your daily and future survival, I strongly recommend that you only consume and store foods you produce or that you obtain from local growers that you know. I feel that this is the area of greatest weakness in our society and therefore our greatest risk of shortages, contamination, and inflation. Even if you are on a very limited budget, buy the most reasonable foods in bulk. They may not be your first food preference but they can save your life. Everyone should have one large shelf rack and one chest freezer filled with food. You could be snowed in or layed-off from work it’s just common sense. Maybe my grandfathers stories of the Depression make me see things differently. Good idea to start up with a (first) shelf rack, water on the lowest shelf with support between the bottom of it and the floor so you can load it up. I have a kind of mini-Walmart in the back pantry. Light items on top– T.P., paper plates etc. The laid off from work was what got me started prepping (though 30 years ago there wasn’t a name for it). I worked construction so feast in the summer months and famine in the winter. I bought basics like flour,beans,rice canned and boxed goods to store in case we ran short of money in the winter. I’m looking forward to reading this series, hopefully to prep smarter. When I first started prepping I purchased canned goods, a little at a time and filled my cabinets. However, now, years later, they are still sitting there. I don’t normally eat canned vegetables or meats so most of them have expired. I hate to waste money and food, so hopefully there’s a better way. Just because the can date is “expired” doesn’t mean that it is bad. Those dates are for retailers to rotate stock and represents more of a best by date. The food is fine to eat just may not be at its peak of taste and appearance. Can goods that are kept in a dry, relatively cool storage area are fine for long after the “expired” date. Make soup. Once you have your soup base, take some of those drained veggies out of the cans and puree them with an immersion blender stick or a food processor. Add them to the soup base and go from there. I keep can goods for at least 1 year past the expiration date. We never have any problems with it. We will even buy items past the date, they are often half price. Things like toothpaste and deodorant also have expiration dates. My wife works at a grocery store and we never pay full price for these items. I’m a prepper on a budget, otherwise we wouldn’t have nearly as much. Level 1 should be a bare minimum for everybody, many times I’ve been glad to have at least that or more. One week goes quickly. My 2¢ on ‘Excesses’; everyone knows the famous quote involving ‘Excesses’. . So I won’t go there. Soooo, you don’t have the time, Really? How much ‘time’ do you sitting watching CRAPO on TV? How about reading ‘Romance Novels’ or whatever? Why not spend a little time learning how to mend a deep wound, starting a camp fire, or fighting off the flu? Knowledge is cheap, often times free. Start by reading some of the Articles here. “I don’t have the money”, ohhhhh really? How about dumping 90% of those BS electronics and get back to actually talking to each other? “The average cell phone bill is now more than $63 per month or $760 per year as of 2010.” That’s a lot of supplies you could get as ‘insurance’ so your family does not starve to death. How about, stop wasting so much. “Americans waste an unfathomable amount of food. In fact, according to a Guardian report released this week, roughly 50 percent of all produce in the United States is thrown away—some 60 million tons (or $160 billion) worth of produce annually”. Don’t dump the ‘leftovers’ save them for another meal, or cook less. No Time and Money are foolish/stupid reasons why ‘NOT’ to be preparing. Heck, try the time proven method of ‘Use one, Buy two’ it works. How in the world do ya think I ended up with 600 rolls of TP LOLOL. Seriously though, also ‘Store what you eat, Eat what you store’ Get the Articles here and READ and (as Nike would say) Just-Do-It… If not for yourself, for your Family and loved ones; or for me so I don’t have to turn ya away when you have nothing after TSHTF. If it is the truth, and those fall under what you described, should pay heed. Only they will know. NRP…..GOOD RANT. Have some good orange spice tea on me. Where is the chocolate? I have mine in glass canning jars vacuum sealed-jic. AC..ACDH… Chocolate never lasts long enough to vac seal it !!!! Than you Sir, always time for a cup of fine tea. Folks our age recall the toilet paper shortage of 1973. “Tonight Show” host Johnny Carson made a joke, saying there was an acute shortage of toilet paper at the stores. Minutes later there was a rush on the stores and the next morning the shelves were bare. Panicked consumers waited in lines for deliveries to be placed on the shelves, emptying the shelves in minutes. Carson was forced to attempt to calm the population the next night, explaining it had just been a joke. Still, it took three weeks for toilet paper inventories to recover. Don’t remember that one, but I do remember the Gas shortages and the 4-5-6 block lines at the pumps, AND the fights over a gallon of fuel. Just shows ya what the human brain reverts back to when you simply suggest something. person will always find time for what is really important to them.” So I guess by watching someone, we will find out what is important to them. Like hoarding TP. I agree whole heartedly, Hording TP can be an addiction, no different than being on Crack or Meth. I also know some people that think that prepping is no different than Hording, stick with me here. Now I truly believe that preparing is something that everyone should be doing to assure their own survival and the well-being of their Loved Ones. Since I also strongly think that we all should be concerned with the care and future of our families and others around than should we ALL not be at least doing ‘some’ preparing? Or maybe even a little Hording? To EVERYONE that’s not at least saving a little and trying to get to Level ONE, please do, it’s your life and families lives you may save. PS; 600 rolls of TP is NOT hording…. I’m just a big azzzzzzzzzzz LOL, Gata have a little fun ya know. PSS; Abusing Drugs is just all out STUIPD. I’m somewhere along the 2-3 line. About 4 years ago I tripped over the dog and broke my kneecap into a bunch of pieces. I was off work for 10 months, lost 50% of an already tight income. Anyone that doesn’t have ‘something’ stashed is just plain asking for trouble. Oh no! Tripped over your dog? 2 1/2 years ago I slipped on the ice and fell down my front steps. I was out of commission for 6 weeks, but I had enough of everything stored and I was fine. My problem was not money (I have Social Security and Medicare) but no ability to get to the store because there was a lake of ice between my front door and my car. Couldn’t get down the front steps or across that ice rink on crutches. If I had been out of commission for 10 months instead of 6 weeks OR if I had lost my income, I wouldn’t have fared nearly as well as you did. Thank goodness you were prepared! I was in one of those multiple hinged many straps leg braces for a long time. First session with the therapist had her saying that she not seen a knee that stiff in years and why did he do that?! It was around the 4 month mark that I could bend it just enough to get in my large van and behind the wheel- not that the therapist suggested that I should do it :/ But it got me down the back road to Walmart at least. Some folks took all that was offered, and when they drove away, they stopped at a dumpster, in the lot, and threw all the fresh vegetables in. They kept the canned and frozen foods. All that food would probably have been welcomed by others. Too much work to cook, I guess. Our local food pantry won’t take fresh foods; nobody wants them. I had too many vegetables last year, especially squash, but my veggies were unwelcome. That is a serious shame. I can only imagine how tasty and how much enjoyed the fresh veg would have been. My aunt lives in a seniors sort of set up..small units all the same, with a garden/yard at the back. She plants her and three other gardens each yr (the others don’t want/can’t manage a garden), and donates most to other individual seniors who cannot manage a garden. She takes the boxes of “whatever” over to individuals, and they are thrilled. Preparedness can be like Business and Real Estate = Location, Location, Location. Living in a city, or even the suburbs can be fatal in a major preparedness-level emergency. Try to acquire no less than five acres with your own water and a food storage/pantry (large) area. This way you can grow your own veggies, raise some meat and even do some light duty target practice with the neighbors. Best of luck and especially blessings to all. Frozen and unsalted/no salt canned vegetables are a pretty good option. May not be quite as good as fresh, but last well. I eat the canned foods my wife does not like on my version of lights out weekends or roughing it picnics as my prepping practice for SHTF that may happen. I have a job-in-town and so most of my preps are in the form of canned food from grocery warehouses like Winco in Pacific Northwest. Labeling and marking date of canning, purchase or manufacture comes second nature as your supplies grow. These days, I write down load data on my boxes of reloaded ammo in addition to date. As your supply shelves grow crowded and heavy, you will reap the benefits of this practice a year or more down the road as it aids in inventory of stores. If you buy freeze-dried foods in foil/plastic pouches, store these in a metal, rodent proof container as I lost several hundred dollars in freeze dried foods years ago to mice. I keep mine in a new galvanized garbage can with the lid tied in place these days. Pork and beans plus ramen noodles are the perfect choice for emergency food stash because: When times are good, they will remain untouched because there are other things we would rather eat. When times are bad, they taste good and fill the belly. Both items were kept in emergency food caches I made in the district I worked in as a ranger. When the food was gone, there was frequently a thank you note left behind. Your tax dollars at work. Your words are so true, the question is how do ya get through to some people, or do ya even try anymore? Water is not a big deal with a little forethought and basic planning. We have two Life straws in every BOB and a Swayer in each tactical vest. You can even get some of those nasty tasting water purification pills like the military used. As for boiling water just build or buy a rocket stove. I make them out of a #10 can, 2 #303 cans and a #202 can. The plans are all over youtube and I have made over 50 of them. This can also give you the boiling water you need for FD foods pasta and a cup of coffee or hot chocolate. I once did a demo at a friend’s store in Alto GA. and cooked breakfast for everyone. Eggs,bacon,grits and coffee on a few twigs and sticks as fuel. I have mostly given up. I am 67and very old school, old Yankee,use it up ware it out, make it do or do without. Today I think I am one of a few who remember these things. Even here in NH old school is dead. Even though I am sure bad times are coming most all just want to eat drink and be mary.kind of hard to have any concerns for them,even tho that’s not how I was raised. Young couple just down the road I have hopes for,guess ones a start. Oh,oldest son hope’s things go bad,he thinks it will be like the wild West just shoot everything up but I have all the guns. Like I said ones a start!